Sheikh Abdullah Al-Jabir Palace is part of the Tentative list of Kuwait in order to qualify for inclusion in the World Heritage List. Close to the Kuwait Towers lies the Sheikh Abdullah Al-Jabir Palace. It is displayed on maps as the Diwan Khazaal, named after the Khazaal family to which this historic house and guest house belonged in the early 20th century. Later on it was converted by Sheikh Abdullah Al-Jabir Al- Sabah (hence the full name) to his residence and it became the first national museum of Kuwait. The two-storey building, partly built of coral stone, is said to have been the most magnificent building of Kuwait City in its time. 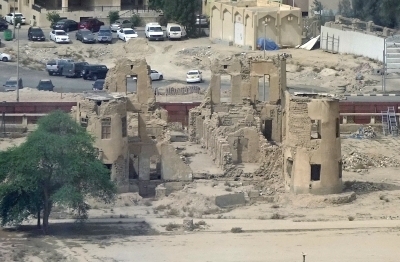 The building was heavily bombed by the Iraqis during the Gulf War and has still not been restored. That did not stop the Kuwaiti authorities to promote it to the Tentative List in 2015. I walked past it on my way from the hotel, and found it totally fenced off and hidden behind a cardboard wall. Fortunately it can be seen very well from the viewing platform of the Kuwait Towers: it’s the ruin with the four corner towers. This is only one of the ruins that is still visible in Kuwait City: it amazed me that several buildings in the city center have been left in such a bad state.